I have been thinking about this lady a lot lately. 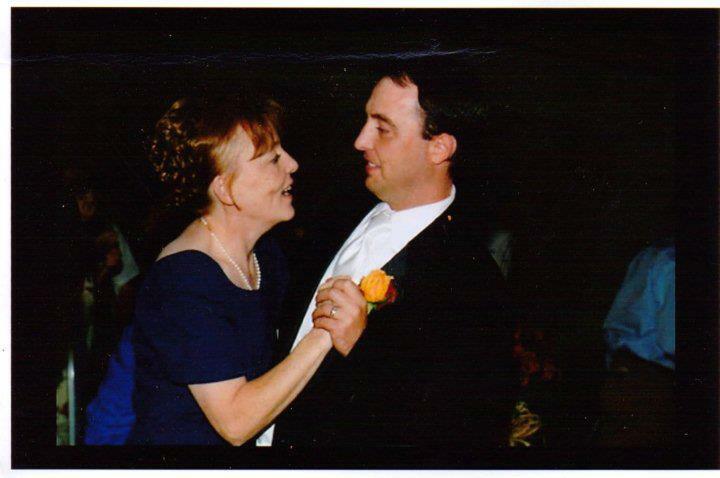 That's me and my mom dancing at my wedding back in 2004. And I am so grateful that I was able to share that special moment with her. Then you learn that those you love the most are not superheroes. She passed away in 2008. There's not a day that goes by that I don't miss her. But she has really been on my mind the past few days. I'm not sure what is going on. Maybe it's because it was Mrs. Shife's birthday recently and my mom always made sure Mrs. Shife knew how much she was loved and appreciated by that side of the family. Maybe it's because Kyle is turning 10 this year and I have been thinking about much how much she would have enjoyed being his grandma. Maybe it's because I just miss that special lady that I called mom. Maybe it's because I know in the air I breathe that she's there to guide me. Maybe it's because I will forever be grateful for the life she gave me. Whatever the reason, thank you, mom. Aw Matt, I loved this even though it made my eyes water. Your mother set an excellent example and those who follow her must do the same. God bless, my friend. I just lost my Dad last month so your post is especially poignant to me. I miss him. I am remembering a line from the film, "Chairiots of Fire"...and Eric Liddell is speaking of how He felt that God wanted him to run. "When I run, I feel His pleasure." So, when I climbed a local mountain yesterday, I felt my Dad with me and he was pleased. We miss those special moms the most!!! It's good to have those loved ones in the forefront of our minds from time to time, even if it makes our feelings more raw for a bit. Your mom raised a good man. And that influence will pass through you to your kids, just remember that. That is a lovely picture. You are blessed to have such a special relationship; that will never end. She sounds like an exceptional Mom, and it's not surprising she will spring to mind. There are times when we wish we could just have one more conversation, or hug. Great photo of the two of you! That's a lovely photo of your mom. I miss my dad the way you miss your mother. And despite what they say, it doesn't get any easier, if anything harder because you see all the things they are missing out on. My dad never saw my Granddaughter. He would have loved her so much.